Start here as this test will help you figure out which body systems are the weakest. Like the musicians who make up an orchestra, the body systems-digestive, intestinal, circulatory, nervous, immune, respiratory, urinary, glandular and structural-must all work in harmony. When a concern in one body system arises, other systems are affected. Total health requires that all body systems be balanced. Probably the most important page. Thyroid issues affecting 40-50% of the USA population. The thyroid is a very important endocrine gland. Problems with the thyroid gland are extremely common. It has been estimated that as many as one and a half billion people in the world are at risk for thyroid problems. Hypothyroid (low thyroid function) is the most common thyroid malfunction, but it is also possible to have a hyperactive thyroid gland. We'll address both. pH is a measure of the acidity or alkalinity of a solution. The lower the pH the more acidic the solution is. The higher a pH number, the more alkaline the solution is. Is your body "acidic" or "Alkaline"? High acidity can affect all major body systems, especially the digestive, intestinal, circulatory, respiratory and immune systems. A pH-balanced environment maintains proper metabolic function and allows the body to function optimally. It also maintains alkaline reserves that are used to meet emergency demands. Toxic waste can "clog" our eliminative channels creating numerous disease symptoms. Every day, our body manufactures waste in the process of metabolism. Every day, we also ingest substances through food, water and air that are potentially harmful for our system. Fortunately, the body has the capacity to deal with this problem. The body rids itself of metabolic waste and chemical irritants through various eliminative systems. Although medical science tends to discredit the idea of cleansing, natural healers have long stressed the importance of maintaining good elimination for better health. Menstrual problems are one of the most common reasons that women see their doctor. Indeed, 80 per cent of women experience premenstrual syndrome (PMS) and between 40 to 70 per cent suffer from period pain, with about one in 10 experiencing so much discomfort it interferes with their daily lives. 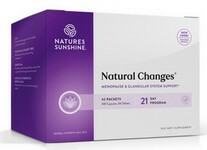 Homeopathic support for PMS and Menopause on this page. Does your body need...Antioxidants? Enzymes? Fatty Acids? Fiber? Probiotics? Trace Minerals? 1. Are your Hormones "balanced"? The hormones we are most concerned about here are estrogen, progesterone, and testosterone. Today, millions of women concerned about aging must decide whether or not to undergo synthetic hormone replacement therapy and suffer its side effects and increased risks of cancer. But there is revolutionary news about completely safe, natural progesterone, the only hormone supplement women may need as they age. A number of medications can help treat and prevent migraines and tension headaches. Most tension headaches can be helped by taking pain relievers such as aspirin, Aleve, Tylenol, or Advil. But be careful! Taking too many of these easy-to-buy pills is a major cause of new, more-difficult-to-treat headaches called rebound or pain reliever-induced headaches. Headaches come in a number of forms, differentiated by their causes and specific symptoms. To prevent bladder infections unsweetened cranberry juice is helpful. The Cranberry/Buchu combination will also help prevent, but not treat bladder infections. When there is an active infection, use remedies such as Goldenseal, Silver Shield, Uva ursi or Ultimate Echinacea to fight the infection. Everyone has yeast in their body and normally, this yeast is completely benign. The body's defenses have to be compromised in some way in order for yeast to start to multiply out of control. The most common reason why yeast starts growing out of control is antibiotics. Antibiotics not only kill disease-causing bacteria, they also kill the friendly bacteria in our bodies. These friendly bacteria keep yeast in check, so when they are gone, yeast start multiplying. But antibiotics ARE NOT the only factor in yeast overgrowth.Yeast infection is an internal problem, not external. Never one cause for this issue!